Canker sores are small cuts, lacerations or ulcers on the tongue, and the inside of the cheeks and mouth, lips and throat. 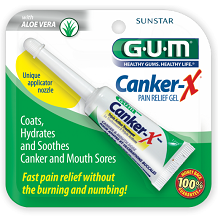 Our review examines GUM Canker-X Gel, a soothing formulation meant to treat canker sores. These little ulcers can be due to stress, spicy foods, food allergies, acidic foods, dental fixtures or treatments, exhaustion, vitamin deficiencies, hormonal changes and autoimmune disorders. These sores are not the same as cold sores or fever blisters. The herpes virus is responsible for cold sores. The formula is based on a combination of natural and synthetic ingredients. The star ingredient in this gel is Aloe Vera. In our review we note this as a positive. Aloe Vera is known to soothe irritation and reduce inflammation. 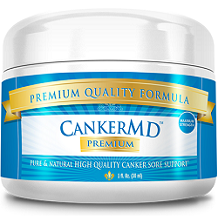 It also speeds up healing of the soft tissue in the mouth where canker sores are located. Aloe Vera is loaded with vitamins, enzymes, amino acids and polysaccharides. Together, these promote quick tissue recovery. The formula also contains synthetic products such as preservatives and water binders to give it its gel consistency. This enables the gel to work as a healing barrier. It allows the open sore to heal free from oxidants and irritants. The product does not cause stinging or burning, where as some other products do. The drawback we note in this review is that the formula does not appear to prevent subsequent outbreaks. An addition such as Vitamin B12 would have helped to address one of the underlying causes, namely vitamin deficiencies. Apply the gel to the sore with clean hands several times a day. Do not move your mouth, eat or drink to allow the gel to set. The product is safe for use by people of all ages. There are no notable side effects. Sodium Benzoate has been linked to blood cancers and leukemia, but only when consumed in considerable amounts. You’ll pay $6.95 for one tube of gel online. There is a 30-day money-back guarantee. However, this only applies to products in new condition. The guarantee is for defective products or incorrect shipments, not for products already used. You also need to get pre-authorization from customer service before proceeding with the return. The gel nature of the product increases its efficacy by providing a protective barrier while the laceration heals. The choice of Aloe Vera as the main ingredient is sensible and likely to soothe the wound and speed up healing. It is also relatively inexpensive. Additionally, GUM Canker-X Gel has been met with decent reviews. This is not the product for you if you are looking for an all-natural product or looking to try the gel risk-free. The guarantee is complicated and rife with conditions. It may also not be the best product if you are prone to repeated outbreaks, as the synthesis does not contain ingredients that prevent the likelihood of sores long-term. Alternatively, use the product but supplement it with a Vitamin B12-rich product, or a supplement promoting increased immunity.